What is Sports Hernia (Athletic Pubalgia)? A sports hernia or athletic pubalgia is a condition which is caused by weakness of the abdominal wall muscles or tendons. As a result of this weakness, athletic activities which require high speed twisting, turning, jumping, running, and cutting can often lead to a tear where the abdominal muscles and tendons meet the bones of the pelvis. As a result of this tear or weakness, the contents of the abdomen pushes out. This pressure from the contents pushing out can often result in a pinching pain and swelling in the groin and lower abdominal region. The image provided displays the approximate region where the sports hernia can occur. This pain is further increased with sudden movements such as running, jumping, kicking, going up/down stairs, sneezing or coughing. Having a strong core and abdominal muscles can help minimize occurrence of the injury, but having good hip flexor flexibility plays an important role in prevention as well. A sports hernia can be diagnosed by a physician. There will be tenderness in the region of the groin and where the bulge is likely occurring. Tests can be performed to rule out other causes of groin & lower abdominal pain. A MRI can also be performed to identify a tear. Conservative treatments such as rest, anti-inflammatory medications, ice and physical therapy are often tried first. However, once a sports hernia has been diagnosed surgery is the primary means of repairing this injury. Recovery after surgery can take anywhere from 4-52 weeks based on the severity of the injury and the surgical procedure performed. 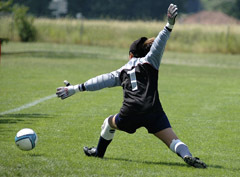 Rehabilitation is often required after surgery in order to return to sports.